Call it a tale or a fable, there are plenty of stories that revolve around Taramati Baradari — a caravan station inside Ibrahim Bagh, a Persian-style garden. Turned into a hotel by the government, you can feel like a royalty here. Taramati Baradari is said to be built during the reign of Quli Qutb Shah who named it after a courtesan — Taramati. This caravan station has 12 doorways and it is a sight to behold after sunset as it is lit up. As of today, it is a popular venue for wedding venues and photoshoots, this monument is on top of a hill and offers a brilliant view of the city. Surrounded by royal gardens, this is a proper resort maintained by Telangana government. There are two types of rooms — a suite and a standard room. Both the rooms give you an access to the entire resort and you can go on a cultural exploration. Find carvings on the walls and Instagram some sculptures after you dig into a meal at Haritha restaurant. Plus, it has a pool. 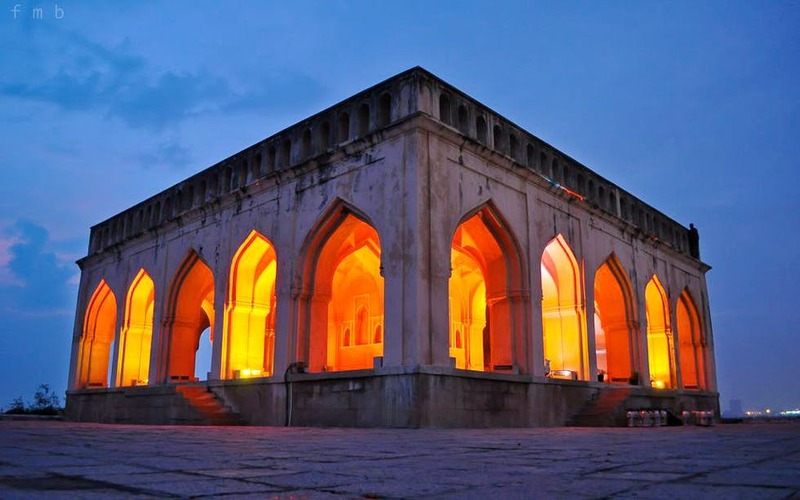 Another good thing is that it's located just 4km from Golconda Fort, so if you're not up for an overnight stay, get here during the sunset hour. The rooms are a bit basic, and we really hoped there would be a regal touch to this kind of heritage hotel.